What to do… Seed vs sodding your lawn? Your lawn has probably seen better days and you need to make a decision on how to improve it and fast (BBQ season is pretty much here, after all)! We all want that luscious, green, weed-free grass that our neighbors will envy. The question is, how do we get it? Sadly, the answer is usually starting from scratch. So, say your farewells to your old lawn and let’s dig in! The Pro – Larger selection of species available. Different mixes of species and blends of different cultivars are available for specific management practices, sun or shade, disease resistance, and soil type. Turf develops in the environment in which it will live. The Con – Timing of establishment critical. Best time is September. April is also a good time, but weed seeds germinate in greater numbers in spring. Longer time period to get a dense lawn. 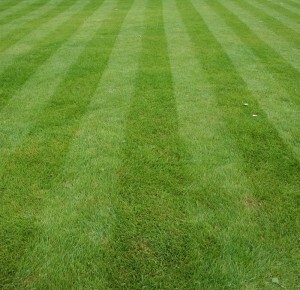 May require reseeding due to poor germination in some areas or wash outs from heavy rain or irrigation. Weeds can be a problem until lawn is fully established. Initial watering is critical. The Pro – Sodding is a great alternative to seeding because your lawn is ready to enjoy much faster. There’s no waiting for the grass to germinate and grow, that work was done for you on the farm- hence the added cost. There is some initial maintenance with sodding but much less maintenance than seeding. Dust, mud and erosion are quickly reduced and it’s basically weed-free. The Con – You will have less options for your sunny and shady parts of your lawn with sodding as typically one grass type is purchased and used on your entire lawn. It also requires a lot of initial watering. To Sum it Up – Should you Seed or Sod Your Lawn? Seed or Sod – F.A. Hobson does it right!